Guacamole this time year is a perfect dip, meaning avocados are on sale this time of year and they are good! Did you know more avocados are sold the week prior to Super Bowl than any other time of year? 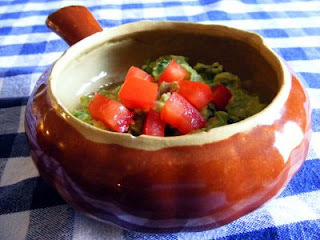 Here is my recipe for guacamole, give it a try! I mix all of the ingredients together and then really stir it up. This way you still have chunky guacamole and not mush, don't like to eat green mush. The lime juice will help the avocado from turning but ours never last very long. Munch out with your favorite tortilla chips! Hmm - I've never tried it with lime, I always use lemon .. will have to try it. Hooray for chunky guac!